Headed up by Daniel Davies, DJD Consultants are an independent care consultancy service who provides CQC registered organisations with a specialist level of advice and support to ensure compliance. We provide our clients with tools and solutions... that help and prevent future problems and breakdowns of your support systems and policy structure. This in turn promotes high quality care delivery and puts the assurance back into your service. We’re there to help you put the pieces back together. We also offer and deliver training around most aspects of care for all levels of staff and personnel. Our trainers are certificated, accredited and qualified to train in their particular area of expertise The key strength of our team is that everyone brings a huge level of direct hands on experience from within health and social care. This enables them to share their knowledge and expertise which in turn can utilised in your service. Bespoke packages in: SOVA, MCA/DOLS, Moving & Handling, Person Centred Care, Food Hygiene, Health & Safety, Infection Control, Fire, Dementia Awareness, Care Planning, Medication Admin, Provider Compliance Assessment, Palliative Care. DJD SOCIAL CARE CONSULTANTS attends to matters with the utmost diligence. 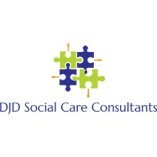 DJD SOCIAL CARE CONSULTANTS provides services above and beyond what is expected. Trainer Catherine Parker is excellent, friendly, jolly and very good explainer. Learnt a lot of interesting information , and understood it all very well. Did a lot of team work and involvement. Everything was explained ever so easily and in detail. There was no rushing in any part of the module. The practical element was also demonstrated and explained very well and was given another chance go re do on the last day of training which was very helpful. It was a clean safe environment and was taught by a very good teacher .who explained in good plain English which was very helpful. I found the training to be well presented, well communicated and informative. Training is sometimes a school setting and therefore you tend not to want to go, but with DJD the training he delivered was excellent he made us all feel combatable, and explained everything in detail. he got everyone who attended together and got everyone involved ,he made the whole experience fun but maintained professional at all times, you felt that you could ask him anything and he would answer and not make you feel incompetent . I will defiantly recommend DJD . The teaching technique used throughout the training was exceptionally good, easy to understsand and follow through, a very good consultant. Would recommend to all. Flexible and professional. Staff had good fun and improved their knowledge at the same time. Having 120 care workers based in home care it is extremely difficult to get them together for training. DJD have the flexibility to make this happen. I was interested in the format of Daniel's example support plan. It was good that most of the information about an individual is on the first page and it shows outcomes that an individual wants to reach. Excellent professional service using a variety of teaching methods. Would definitely recommend this service. The level of the knowledge from Daniel Davies and the way in which he delivers the training. Lots of opportunities for discussions and questions rather than just all powerpoint.